Is Vitara Brezza better than similarly priced Ameo, Baleno, EcoSport, Dzire & Ciaz? Brezza ‘LDi O’ costs 8.3 Lakh Rs. on road Delhi. It is the cheapest diesel SUV on the market. Other options at this price include the Volkswagen Ameo ‘Trendline’, Baleno ‘Delta’ & Elite i20 ‘Magna’ diesels. All three of them have a few extra features that are absent in the Brezza. However none of them have the rough-road suitability of the Brezza, which is absolutely indispensable on Indian roads. The Brezza ‘LDi O’ is simply the most reliable, practical and the best value-for-money of all cars up to 8.9 Lakh Rs. in India. Check out our Vitara Brezza vs Baleno, Vitara Brezza vs Ameo & Vitara Brezza vs Elite i20 comparisons for detailed analysis. Brezza ‘LDi O’ costs 8.9 Lakh Rs. on road Delhi. It is the cheapest diesel SUV on the market. Other options at this price include the Volkswagen Ameo ‘Comfortline’ and EcoSport ‘Ambiente’ diesels. Ameo has the most number of extra features, followed by Brezza, while the EcoSport has the least number of features. But what the Ameo lacks is the real-world suitability to Indian roads, the Brezza & EcoSport have higher Ground Clearance, bigger Wheels and Tyres and sturdier suspension, which makes them immensely more suitable to Indian road conditions than the Ameo. We would recommend sturdier underpinnings over the few extra electronic gimmicks to our readers any day! That being said, it is the Brezza which inspires more confidence towards its reliability, after sales service and resale value over the EcoSport. Overall the Vitara Brezza ‘VDi O’ is the best car in the market up to 9.7 Lakh Rs. and is highly recommended by us. Check out our Vitara Brezza vs Baleno and Vitara Brezza vs EcoSport comparisons for detailed analysis. When it comes to the ZDi, the option of Dzire ZDi AGS automatic comes into picture. On one hand you have better suitability to Indian road condition with the Brezza, while on the other hand you have the convenience of the AMT automatic gearbox with the Dzire AGS. If your usage is primarily going to be in city traffic, go for the Dzire ZDi AGS with your eyes closed. However, if your usage is primarily in semi-urban and rough road environments, the Brezza would be a better choice. Check out our Vitara Brezza vs Dzire comparison for further details. There’s also the option of the EcoSport ‘Trend’, but it loses out to the Brezza in terms of reliability, service support, resale value, fuel efficiency & feature richness. Check out our Vitara Brezza vs EcoSport Comparison for a comprehensive analysis. The problem with the ZDi+ is that it enters into the 1.5 iVTEC territory of Honda City & BR-V. The Brezza is no match to the all-round capabilities of the City & BR-V be it in terms of performance, refinement, space, ergonomics, interiors etc. Which is why we recommend the Brezza only to those who anticipate a usage of over 1-1.5 Lakh kilometers in the 5 to 7 years, for the rest we recommend the City ‘S MT’ over the Brezza ZDi+. 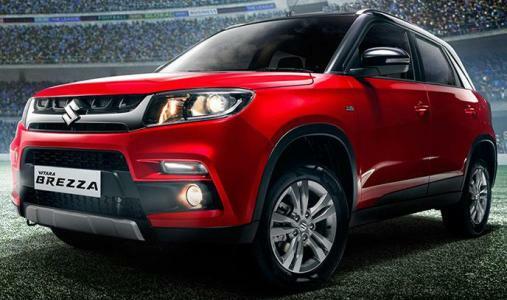 Check out our detailed Vitara Brezza vs City & Vitara Brezza vs BR-V comparison for detailed analysis. The second problem for the ZDi+ is the highly capable automatic geared alternative, the Ciaz ‘VXi+ AT’. It works out to be 1 lakh Rs. or about 15% more expensive than the Brezza ZDi+ in terms of Overall Ownership Cost. But then if your usage is mostly on city streets, the automatic gearbox can take away half the fatigue of your daily commute by eliminating the pain of constant clutching-de-clutching and gear-rowing. And with the Brezza's irritable turbo-lag bumper-to-bumper commuting becomes even more painful than usual. We recommend the Brezza only to those who anticipate a usage of over 1-1.5 Lakh kilometers in the 5 to 7 years, for the rest we recommend the Ciaz ‘VXi+ AT’ over the Brezza 'ZDi+'. Check out our detailed Vitara Brezza vs Ciaz Comparison for detailed analysis.